Cerebellar architecture is organized around the Purkinje cell. Purkinje cells in the mouse cerebellum come in many different subtypes, organized first into four transverse zones and then further grouped into hundreds of reproducible topographical units – stripes. Stripes are identified by their functional properties, connectivity, and expression profiles. The molecular pattern of stripes is highly reproducible between individuals and is conserved through evolution. Pattern formation in the cerebellar cortex is a multistage process that begins with the generation of the Purkinje cells in the ventricular zone (VZ) of the fourth ventricle. During this stage, or shortly after, Purkinje cell subtypes are specified toward specific positions. Purkinje cells migrate from the VZ to form an array of clusters that form the framework for cerebellar topography. At around birth, these clusters begin to disperse, triggered by Reelin signaling pathway proteins, to form the adult stripe array. 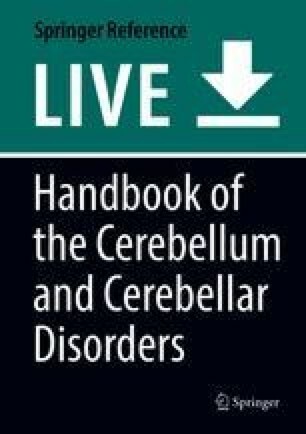 The chapter will begin with a brief overview of adult cerebellar topography, primarily focusing on the mouse cerebellum, and then discuss the cellular and molecular mechanisms that establish these remarkable patterns. Considering how functionally diverse the cerebellum is despite its conserved organization of patterns, this chapter will end exploring how stripes might contribute to neuronal activity and the execution of cerebellar-dependent behaviors. This work was supported by funds from Baylor College of Medicine (BCM) and Texas Children’s Hospital, BCM IDDRC Grant U54HD083092 from the Eunice Kennedy Shriver National Institute of Child Health and Human Development (The IDDRC Neuropathology Sub-Core contributed to the tissue staining experiments), and by the National Institutes of Neurological Disorders and Stroke (NINDS) R01NS089664 and R01NS100874 to RVS.